Roatan was my first real Scuba diving trip. I was ready to get my Open Water Diver certification, and I’ve heard how cheap and great Roatan was for that very purpose. Indeed, it is well known in North America as one of the cheapest places to go diving. Unfortunately, it was hard to find tourism information. I had to ask questions on forums to try to prepare for the trip, and even after reading all the available guide books, I ended up traveling poorly prepared in some respects. But I also got very lucky in a few others, so I will share all of my knowledge for the best possible experience for diving in Roatan. Roatan is easy to get to from US and Canada. There are direct flights to the island from Toronto, Montreal, Atlanta, Dallas, Houston, and Miami. There is no need to go to mainland Honduras. 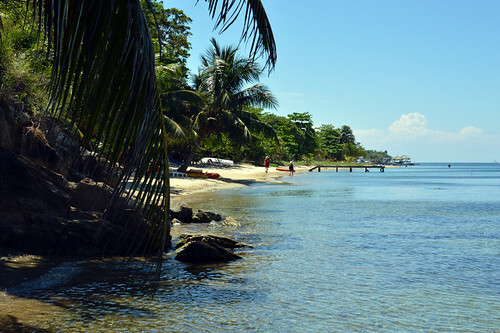 While the island has a real town, Coxen Hole, as well as several upscale resorts, the heart of diving tourism is West End, a beach-side settlement with wooden houses and a visible Canadian population. Although small, it is incredibly laid-back, safe, and friendly (just like Canada, eh?). Diving is a way of life here, and the reef is spectacular! A truly a charming gem among Caribbean diving destinations, Roatan has no high rises, no large hotels, and attracts an intimate international community of diving fanatics. If you are coming for diving and want to experience some night life, West End is really the only place to stay. This is where most dive shops are. The hotels here are not posh but cater to a range of budgets. There is really no need to spend a lot or bring anything fancy to wear – it’s a very casual, earthy place. We stayed at Posada las Orquideas, about a 10 minute walk from West End center. It’s a lovely, simple wooden 3 story hotel with mid-range prices and limited services. We paid in cash for our stay and bought a jug of drinking water from the “receptionist” – one woman with a notebook and a calculator in a small office on the premises. The room was really nice, large, with a kitchenette, a fridge, and a great view of a bay. A really great perk of this hotel is the free use of beach chairs at Arco Iris in West End and Argentinian Grill in West Bay – all have the same owners. You just have to say you are staying at Posada Las Orquideas. 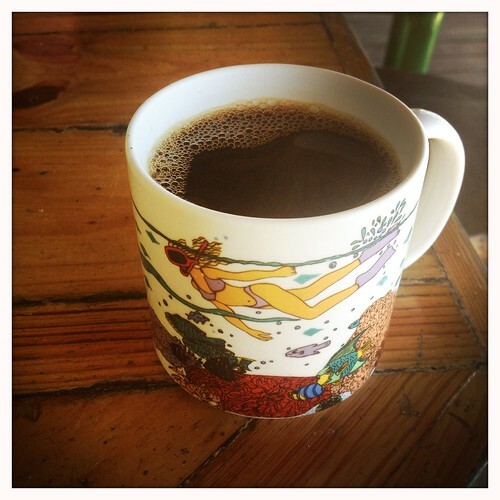 When researching dive shops we relied on the advice of a friend who used to work as a dive instructor on Roatan. We did our Open Water certification with Coconut Tree Divers, which consistently ranks #1 on TripAdvisor. The experience was very good, and it is one of only two dive shops that have their own dock – makes for much easier loading. They have instructors from all over the world, so many languages are accommodated. We contacted them ahead of time and arranged to complete the online portion of the PADI training before leaving home. They were very responsive via email. During my class I got very scared and had several panic moments under water. Coconut Tree owners assigned me a separate instructor and gave me plenty of time to get comfortable with the skills so I could conquer my fears and complete the certification. Dive trips leave twice a day, and the locations are rarely more than 10 minutes away. The reef along Roatan has countless dive sites, and we never experienced any crowds. West End has several bars with good live music in the evenings, and these will be easy to spot every night. At the time of our trip, these were our favorite restaurants and bars. Breakfast was seriously lacking on West End. This is a good reason to try to make your own in your room. We ate at a great vegetarian-friendly Earth Mama, but is has since closed, apparently due to a rent hike. This Canadian beach bar has a fantastic view of the sunset, a flat screen continuously showing hockey or curling, and a cheerful, friendly crowd. We loved coming here for drinks before dinner. There are not many beach vendors in West End, but someone will approach you with cigars for sale. Yes, you can get cubans here. And, upon request, you can get pot as well. This restaurant is run by a British expat who is committed to providing real gourmet dining in the humble Roatan setting. To get there, you have to walk up a dark road to a large guesthouse up the hill from West End, about 10 minutes. The restaurant is on the expensive side, but it’s well worth the price. They even make their own ginger beer for fabulous dark and stormies. The only other thing we did besides diving is spending a day at the beach in West Bay. It has the reputation of the most beautiful beach in Honduras. You can reach it by walking 45 minutes South along the beach or by paying for a water taxi to take you there in about 5 minutes. People told us absurd things like it might be “dangerous” and you might get robbed. One man advised us that to avoid a mugger one should simply run into the water because “Spaniards don’t swim”. These warnings might have some basis in the past, but nothing could be further from the truth today. The walk is beautiful, safe and scenic, and we met several tourists on the way. In a few places you have to wade into the water to get around rocks. West Bay is more “fancy” than West End, with a couple of nice, although small, hotels and restaurants that will serve you right at your beach chair. If you come early, you will have the beach to yourself for a couple of hours. On most days a cruise ship docks in Coxen Hole, and a crowd of tourists descends to West Bay. As a result, there are more vendors offering expensive massage and trinkets. The only vendor worth seeking out is the coconut man – for an additional charge he will add rum to the freshly opened coconut. And after you’re done with the juice, he will even split the coconut in half and get the meat out for you to eat. By 2 p.m. the cruise crowd packs up and leaves, and the beach is once again blissfully empty. Roatan is an island that belongs to Honduras. Therefore, the official currency is the Honduran Lempira. In reality, however, the most useful currency on Roatan is the US Dollar. Moreover, while many businesses take credit cards or PayPal for their products and services, they will charge you a fee as high as 15%. Even hotels want cash! And if you need cash – any cash – obtaining it within the tourist areas is nearly impossible. While trying to get some Lempira, I had to visit 4 different ATMs, only one of which was working, and it gave only 100 dollars at time. On top of that, it deducted money from my account that I never received, and two weeks later my ATM card number was stolen and used to withdraw cash in Greece. My credit card and my husband’s ATM card were also compromised after use in Roatan! So bring a sack full of US Dollars in varying denominations. Restaurant prices in Roatan are not actually low, comparable to United States, so plan accordingly. And of course if you are diving, you will need a lot more money. Lastly, you will need about 40 dollars per person to exit the country, payable at the airport in US Dollars. 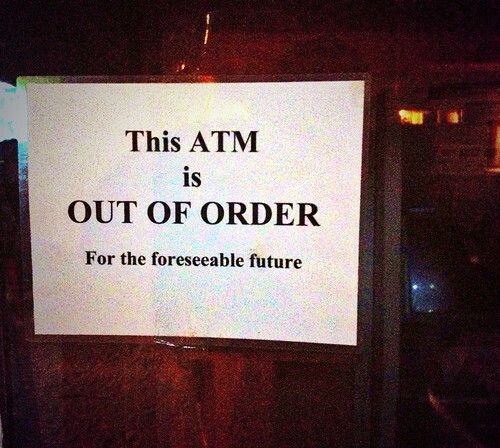 So make sure to have cash set aside for that. I spaced on two important accessories at for a tropical island – beach towels and a hat. 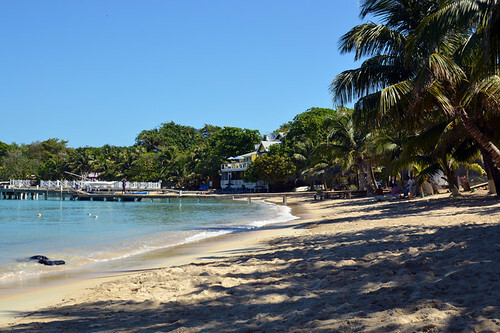 Most hotels in Roatan are very modest and don’t provide beach towels. However, the shops selling basic beach stuff are surprisingly expensive. It took a lot of searching to find a hat that was less than 40 dollars! And now we are proud owners of two psychedelic marine life Roatan towels. When you dive and swim, it’s not uncommon to get small cuts and blisters. What is uncommon on Roatan is basic medical supplies. We could not find Neosporin or any analog in West End or in West Bay, not even at the “pharmacy”. 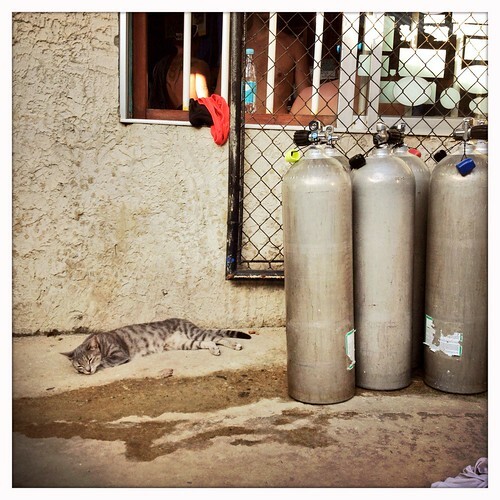 We ended up using some stuff from the dive shop first aid kit, but you really need to have your own first aid basics – antibacterial ointment, pain killers, probiotic pills, and anything you normally use. West End has several good restaurants but very little in the way of convenience stores or snack stands. The guy who runs a grill on Half Moon beach works sporadically, and his repertoire is very limited and mostly fried. The only “grocery store” in West End is full of old cereal for inflated prices. The best source of snacks is the fruit stand or a fruit truck that sells great papaya, pineapples, mango, watermelons and bananas. So bring some packaged high calorie snacks with you – nuts, energy bars, or even something you can cook if your hotel room has a kitchen (oatmeal!). 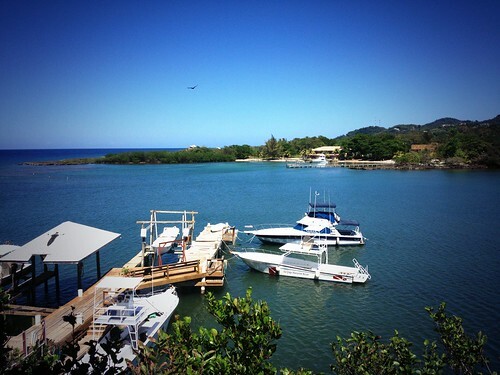 One of the best things about Roatan is its lack of development. However, this also means there are not a lot of street lights, and the roads are imperfect. Moreover, the electricity supply is unreliable, and power outages are not uncommon. Most businesses own backup generators, but that won’t help you get home with only moon and stars to light your way on a gravel road. That is really it for survival advice. 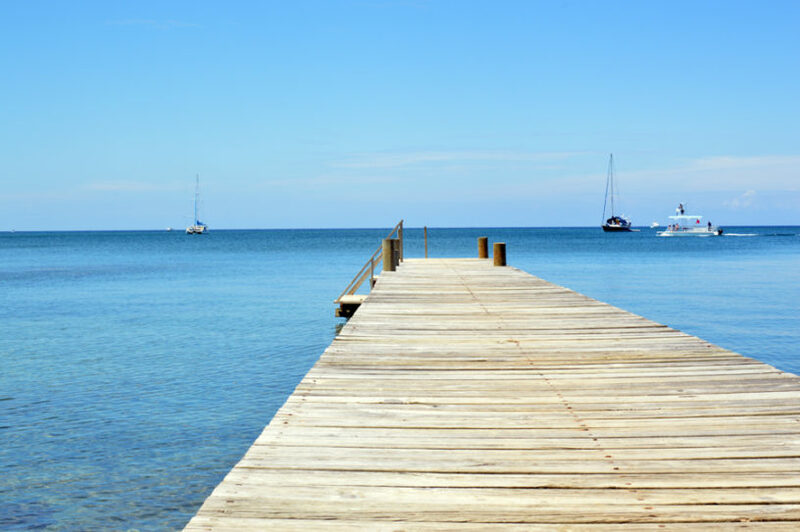 Roatan is made for diving and relaxation, and a trip here is one of the easiest you will ever have.